Advanced Escrow Corporation is a fake escrow site targeting jewelry sellers on eBay. If you have been defrauded by this site please file a report. Elance Escrow Corp. adds trust to the transaction and reduces the potential risk of fraud by acting as a trusted third party that collects, holds and disburses funds according to the Buyer's and Seller's instructions. 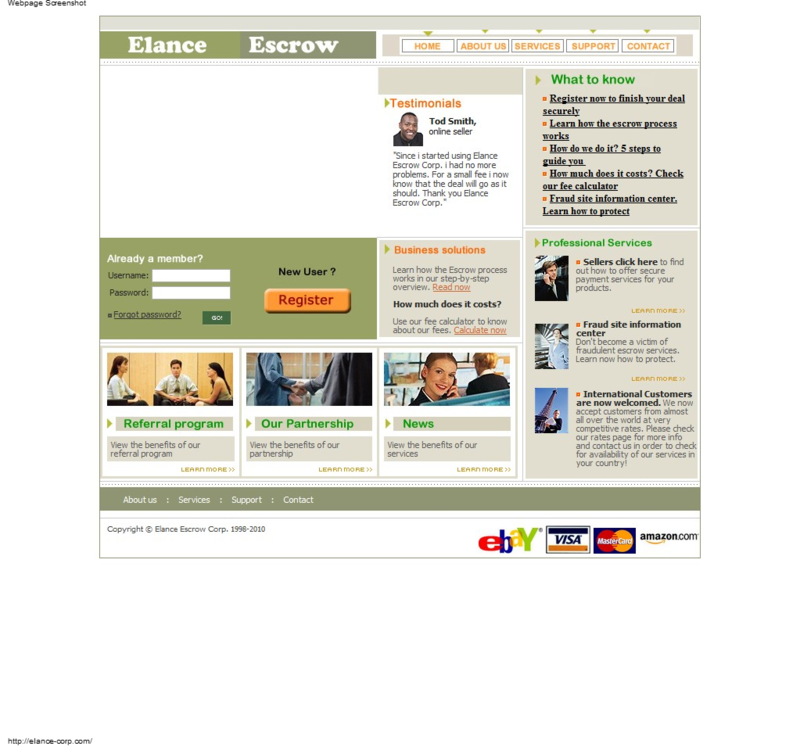 Elance Escrow Corp. services are provided by a licensed and regulated escrow agent. 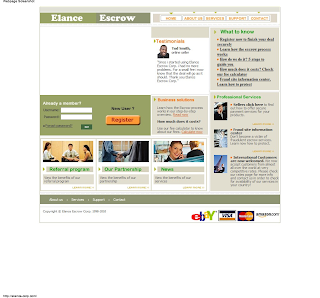 Elance Escrow Corp. is well-suited for items purchased on auction sites, automobiles, motorcycles, domain names, jewelry, specialized computer equipment, and other high-ticket items. When to use another payment service: If you know the other party involved in the transaction, or the merchandise can be personally delivered. Protection for both Buyer and Seller Buyers receive and inspect the merchandise before the Seller is paid. Sellers receive their money if the Buyer accepts the merchandise. Online escrow is a five-step process. It protects the Seller by verifying funds, and protects the Buyer by allowing inspection of the merchandise before payment. With Elance Escrow Corp. , every step in your transaction is verified with proven tracking and verification procedures. Elance Escrow Corp. is an independent escrow company based in Bruxelles..
We were born out of the ever increasing need for fast, reliable transactions which would also not exclude the one value that the Internet Community cherishes most: privacy. we developed a platform that would automate and secure most of the escrow processes in 5 easy steps, while also providing attentive, non-automated customer support through our customer care department. As a buyer, you are the beneficiary of our 5 - step process that postpones the release of your funds until a complete merchandise inspection, during the inspection period. You are also enjoying the advantages of using easily obtainable e-currencies, such as worldwide mobility and most of all, privacy. As a seller, you enjoy the flexibility of our cooperation with major ground-shipment providers, which translates into a reduction of the period of time in which your merchandise reaches your customer. You will also be highly protected against payment fraud, as all disadvantages resulting from credit card payment methods, such as fraudulent use by the prospective buyer, are eliminated. Elance Escrow Corp. is hosted on secure servers using the latest in encryption technology. Alternative BS, the operator of this online system is a licensed and acredited escrow company that operates in compliance with currently applicable escrow regulations, and is also subject to the Financial and Business Code of Bruxell..
What are the escrow steps ? How is the buyer protected ? How is the seller protected ? How do I start a new transaction ? How does the seller get paid in the end ? I've lost my password. What do I do ? What is a Secret Question and why do I need one ? I forgot the answer to my Secret Question. What do I do ? Can I tell the password to my Elance Escrow Corp. account to a friend so that he can use it ? Will Elance Escrow Corp. disclose any private information I provide ? Why is the escrow process safe ? My question wasn't answered here, what should I do ? Both parties agree to terms of the transaction, which includes a description of the merchandise, sale price, number of days for the buyer's inspection period. Step 1 is completed after a transaction has been added to our database by one of the parties and has been accepted by the other. The buyer submits a payment to Elance Escrow Corp. so that good funding can be verified before proceeding to the next step. 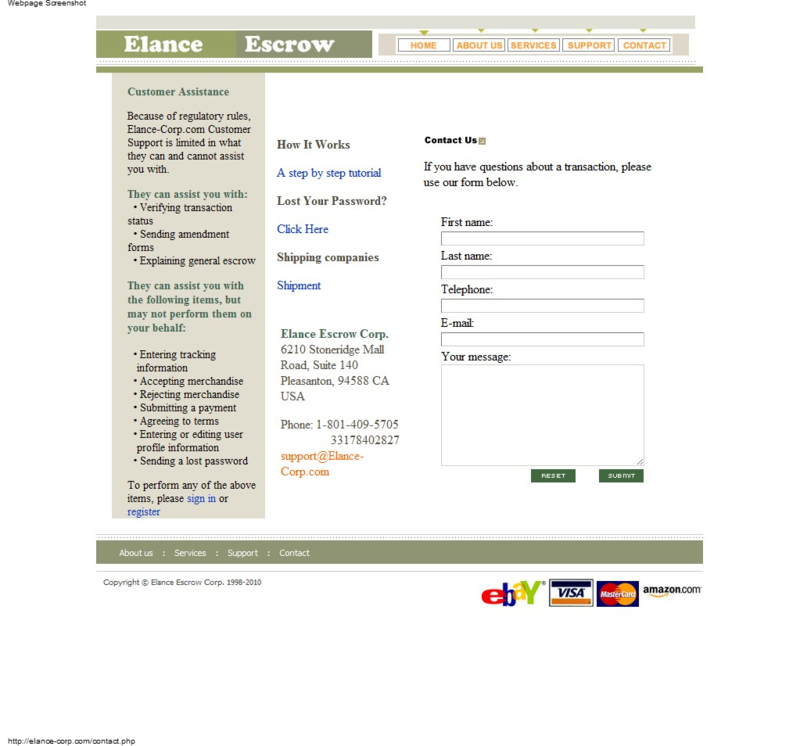 Elance Escrow Corp. authorizes the seller to ship the merchandise and requests tracking information from the latter. Elance Escrow Corp. verifies that the buyer receives the merchandise. The buyer must decide to accept or return the merchandise received before the inspection period expires, or it will become non-returnable. If the buyer accepts the merchandise, Elance Escrow Corp. pays the seller and the transaction is completed. Otherwise, the merchandise is sent back to the seller and, after verification, the money is returned to the buyer. - Elance Escrow Corp. tracks the shipped merchandise (using the tracking number provided by the seller at step 4 ) and verifies it was delivered. - Elance Escrow Corp. notifies the seller when the buyer receives the merchandise. - The seller is authorized to ship the merchandise only after Elance Escrow Corp. verifies the buyer's funds. Once you have a Elance Escrow Corp. account, after logging in, click on New Transaction in the member tools menu at the top of the page. The page that will load will guide you through the rest of the process. On the login module on the left you have a link, right under the password field, which opens a new window where you will be asked the answer to your Secret Question. What is a Secret Question and why do I nee one ? The Secret Question is the question we ask you to provide on the registration page and, together with the Secret Answer it is used to retrieve your password in case you lose it. Common questions would be: "What is my mother's maiden name ? ", "What's the name of my favorite pet ? ", etc. We recommend that you choose a question with a hard to guess answer even for relatives or close friends. If you still have your password, you can access your member page and from the Personal Info page (link located in the member tools menu on the left) you can change it. If you lost both your password and the answer to the Secret Question, you will have to contact Elance Escrow Corp. using the e-mail address that you provided when registering. If the e-mail address you provided when registering is not valid any longer, you may contact Elance Escrow Corp. using another e-mail address and authenticate yourself by providing personal information that you entered when you registered (such as your full address and phone number). You may in no circumstance disclose your password to anyone. Do not enter your Elance Escrow Corp. account password on any website. Elance Escrow Corp. acts as a secure middleman between the buyer and the seller. If you have a Elance Escrow Corp. account, once logged in, you have access to our customer support form (you can click the support link either from the header menu or from the footer links) through which you can request help of any kind. After you submit a support request, our support personnel will analyze it and provide the best solution to your problem via e-mail.